Another day, another forum event! Easter is bringing you joy, chocolate eggs, chocolate and… more eggs! 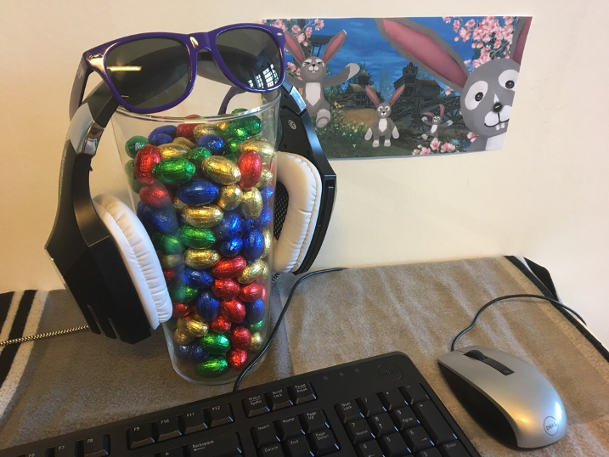 So CM Erinnyes from Defiance 2050 was kind enough to get us this big jar full of chocolate eggs! Well, back to us: can you girls and boys help us count how many eggs will be devoured by the team? Your mission: estimate how many chocolate eggs this jar contains! Get the exact amount right and you will win our newest pet: Easter Bunny! A permanent one. Leave your comment stating your estimation; a number. You can only participate once. Our event will end on the 23rd of April! If you get the frame estimation correct. Let’s say the correct amount is x, so those who estimate a number between x - 5 and x + 5 will get the prizes. Example: correct number is 1000. If you guessed between 995 and 1005 you get the prizes! Well, if you show to be that good at guessing we can’t help it but giving you a permanent Easter Bunny pet! One more thing: Prizes are cumulative! Be fast and take a guess before someone else types that lucky number before you! Our biggest winner is Tronpix from SYPT! And our runner up here is: Karadul !!! Please choose your reward and send us your character name! That beautiful time of the year that we can finally get together with our entire family! Thus, it is more than appropriate that we promote yet another xmas event! This year, we would like to see how creative our players can be!!! So your task is: creating a new Christmas themed banner. Your creation is going to be displayed in ALL of our Facebook pages! Wow! "Ok, so can I just send any image, any size, any format? Can I send, like 2 ima--"
One sec, pal, shall we? We are working for new content. And yes, I do plan on spending time in-game. Just give me a little bit more time, but you might just bump into me in the following days! Hey, Shaiyans! How’s it going? So first of all, we have some news. On one hand, our dear friend Bodhisattva is not part of our team anymore as he has been moved to another one. I’m Kyrie, and I'm really excited about this new quest as your brand new Community Manager! I’ve just joined Shaiya team and now I’m dedicating myself to improving the game so we can keep on having fun! I'm not new to games as they have actually been a great deal of my life. It is a pleasure to work with something that is not only a hobby but also a passion of mine! Please, feel free to reach me on the Forum or on our Discord channel.